There is nothing wrong with baking frozen hamburger patties in the oven. Although putting frozen hamburger meat in the oven increases the cooking time, it is still a quicker option than properly defrosting the patties first. However, there are shortcut defrosting methods that are faster than cooking frozen patties in the oven, if you are pressed for time. 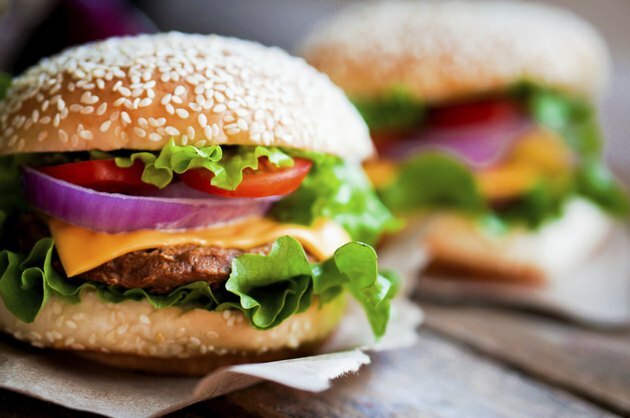 Regardless of exactly how you prepare your hamburgers, it's important to thoroughly cook the ground beef to kill any bacteria, such as e. coli or salmonella, that cause food-borne illnesses. Place the frozen hamburger patties on a lightly greased oven tray. Cover the tray loosely with aluminum foil. Put the tray in the middle of the center oven rack. Bake the hamburger patties for about an hour. Cooking time varies significantly depending on the density and thickness of the patties, as well as differences among individual ovens. Remove the tray using an oven mitt. Uncover the tray and insert the tip of a meat thermometer into the center of the thickest patty, making sure not to press through to the cooking tray. Determine whether the meat has reached 160 degrees, the point at which it is considered safe to eat. Do not rely on textural or visual inspection, as both can be misleading, cautions the United States Department of Agriculture. Return the hamburgers to the oven if they have not yet reached 160 degrees, or if you prefer them more well-done. The best way to defrost frozen hamburger patties is to store them in the refrigerator for five hours per pound, notes The Cook's Thesaurus website. A shortcut is to put the frozen ground beef in a water-tight plastic bag and keep it under a constant stream of cold running water until thawed. Turn the meat over frequently. Cook any meat defrosted in this manner right away. Thawing in the microwave for several minutes works, but it can negatively affect the quality of the final product. A microwave often begins to cook the outside of the patties before the inside is fully thawed, and it can contribute to a rubbery texture in the cooked hamburgers.